Yes, the text might say that the #ESBHeartOfNYC contest is over, but why do they still have the Page Tab available? I am feeling hesitant to trust their social media presence because of this mistake now. I am not even sure that any of the other social media users using the hashtag are aware that there’s no contest. Be transparent – If your brand offers a contest through social media and the prize somehow disappears (where did the $10,000 go?!) OR you decide to cancel the contest, be upfront about this. 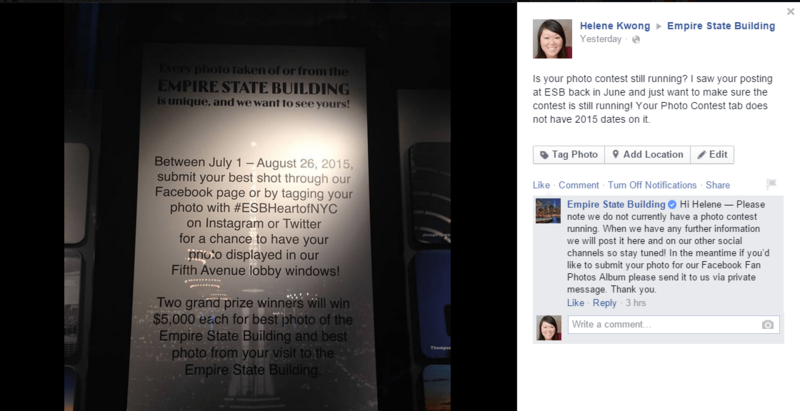 There was no mention across the Empire State Building‘s social media channels of the contest even getting canceled. As I said before, I find it hard to trust the ESB’s social media presence with how they handled this contest situation. Make sure all your teammates are on the same page! – Whether you’re outsourcing your social media or you have an in-house team, make sure everyone is on the same page before you release any new social media news or promotions. If even one team member has the wrong information and shares it publicly on social media (or, in this case, makes a big in-person display), then it’ll be up to you to put out the figurative fires. Stay consistent – If you’re going to cancel a contest on social media, make the announcement across all your platforms. Don’t just assume that people already know, because usually they don’t. 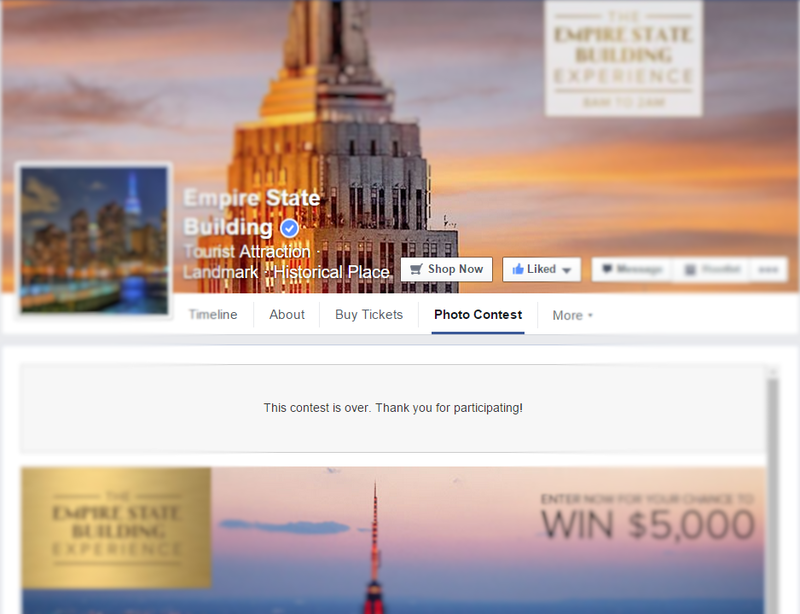 I am probably not the only fan to contact the Empire State Building regarding this contest; they might have announced canceling the contest on Twitter, but they definitely did not make that announcement on Facebook since the “Photo Contest” tab is still rather prominent on their Facebook Page. Here’s to avoiding these kinds of social media mistakes for your brand! Enjoyed this post? Get exclusive social media insights from the Hashtagitude VIP Email, which comes out ever week on Tuesdays or Wednesdays.